Bond no. 9 will launch The Scent of Peace for Him, the masculine counterpart to 2006's The Scent of Peace, in October. 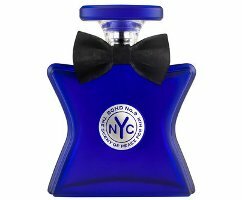 It is fitting that this new artisanal eau de parfum should be designed and made in New York— Bond No. 9’s home town, and the inspiration for our entire collection of metro-scents. After all, New York has long been a melting pot—a place of tolerance and understanding. Home to the United Nations, it is also a city where disparate neighborhoods thrive in proximity and sometimes blend (like a beautiful perfume). And of course the events of 9/11 have underlined for us and the world the importance of tolerance and détente. The scent is a soothing and assured modern masculine blend, composed of both contemporary and traditional fragrance notes. It begins with classic bergamot—a winter citrus with a soft tang. That’s combined with two new flavors: ripe, juicy, tangy pineapple and juniper berry, hinting of both pine and greenery. These segue into the heart notes: blackcurrent—the fresh and elusive smell of cassis; calming cedarwood; and cool, musty, smoky vetiver—a mainstay of men’s perfumery. The Scent of Peace for Him then evolves into its durable base notes, that give it lasting power. Patchouli, amber, and musk—a seductive trifecta; plus moss, adding an earthy forest note. Bond no. 9 The Scent of Peace for Him will be available in 50 ($180) or 100 ($250) ml Eau de Parfum. You have got to be kidding me. And I was just moaning about ‘Arab Spring’ as a name a few posts before. Please, do not drag 9/11, 7/7, or any other horrendous and tragic event into trying to sell a perfume. It looks cheap and exploitative of you. If you’re going to do it, put your money where your mouth is and give all the proceeds of the sales to a related charity. They took some flak for this with the original Scent of Peace, too, but I think it sold well for them. Now I’m trying to remember if any of that scent’s proceeds were donated to charity — can’t remember. And don’t know, possibly this one will have a charity component too. I remember that too. $2 per bottle went to a charity – not sure which one. Honestly, I think that’s a drop in the ocean for what they could afford to do. Jo Malone has a LE candle where all the sales proceeds go to a charity. I know JM is owned by EL now and they can afford to do it, but I think for the amount Bond puts out and sells they could afford to do something along the same lines – maybe not a whole perfume, but a candle, where it isn’t price prohibitive in the first place and knowing everything is going to charity would probably make people want to buy it more. I know what you’re saying, but also appreciate being told an exact dollar amount — when they say “proceeds” I always wonder how much they end up giving away after they take out the cost of the product, the cost of advertising it, the cost of distributing it, etc. I think when people hear “proceeds” they often assume the whole price is going to charity, which probably is never the case. Ya, once I met this guy who was talking about his well oiled business…and talked about how the company was giving to Hurricane Katrina or whatever. I asked, how much exactly are you giving?? He replied, 1% of a sale. I was like oh..really…um..how generous. *thumbs up* If only people smelled like pineapple and vetiver…there would be no more wars. I was offended when Demeter came out with “First Responder” with its whiff of smoke and burning rubber?! WTF? I actually sent an email to the CEO stating extremely poor taste, seriously what are some people thinking (or obviously NOT). Good gosh, really? Wow. Didn’t know that Demeter came out with that. gosh. in addition to the tasteless 9/11 tie-in.. that bow-tie is really stupid. The fragrance sounds nice though. The word “artisanal” has been so overused that it’s lost all meaning. With that bow tie I would have called it the scent of Chippendales…might have been more interesting.